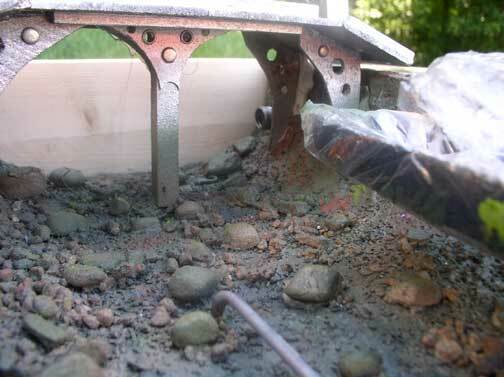 After we added the foam putty to fill in seams that the foam layers created, we hot-glued real river pebbles to the base of the grotto floor. 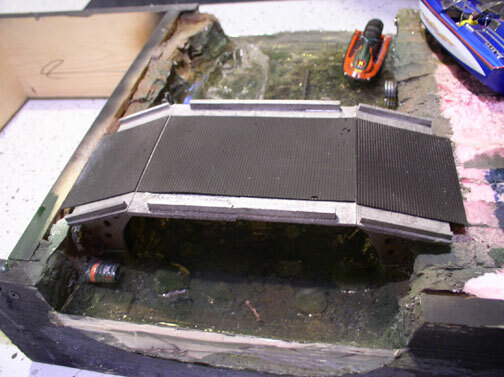 We then spread more foam putty down and shook out various sizes of model railroad “ballast” pebbles to give it a cave lake feel. Again, we were going for NorthEastern US Limestone cave lake. I have actually been caving all through Pennsylvania and the cave streams I’ve crawled through are pretty green-covered and cold. We then added some suede spray paint for a mossy look and added some putty and our own water effect techniques to create a wet area. 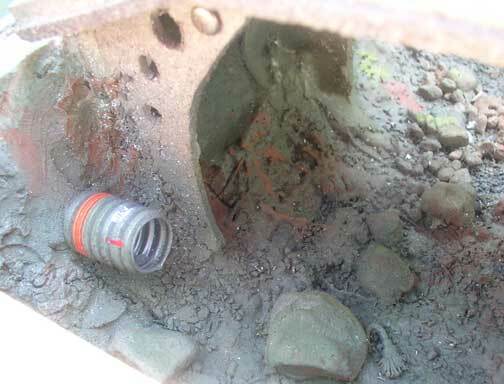 Decals were added to the drainage pipes and set with micro-sol, then weathered. 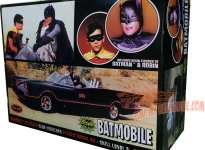 As I mentioned before, this is not just the 1966 TV cave, so why not expand the aquatic transportation options? 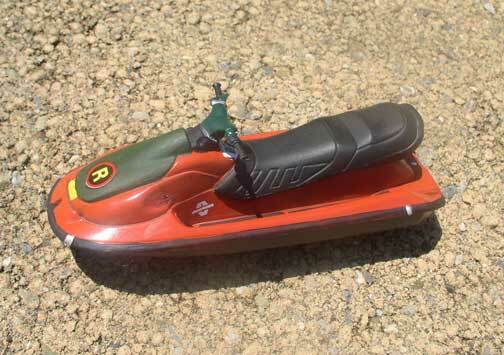 We thought Robin should get his own watercraft. 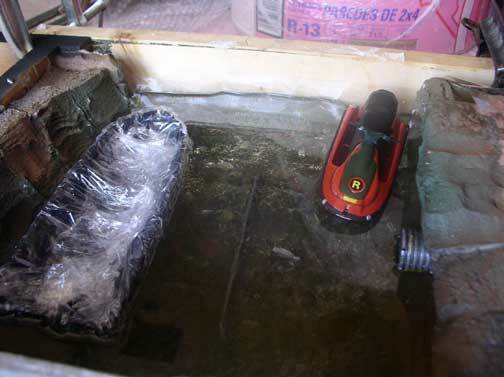 I used to own and ride a big 3-person Seadoo so we thought that would be great to sneak into the cave. Alexander drew and colored many designs. We ended up with a color scheme similar to his 70’s motorcycle. I wasn’t concerned about getting this model back out of the clear water resin later so we just http://your-pharmacies.com mounted it on a clear rod to the lake bottom. Then we clamped up the side openings with wood and plastic tape, and started filling with water. 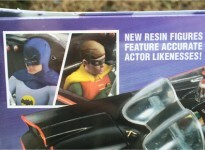 Well, clear resin. We tried several brands and types on some test surfaces. Some cured too slowly, some had an incredibly bad chemical odor as they degassed. Some were made for floral arrangements and cured as a soft, jello-like consistency. The Woodland Scenics product was the absolute worst. It was basically thinned down water-based polyurethane. Absolutely useless for anything but giving the whole bottom a wet look. We needed volume. 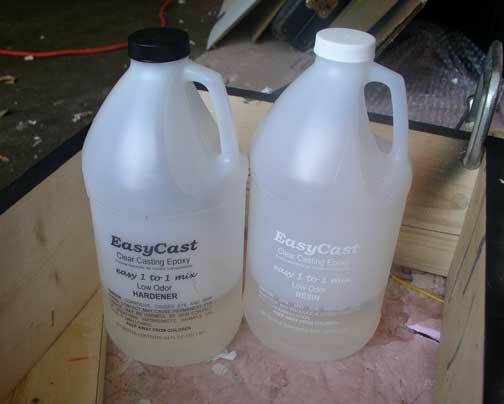 After finding a great but expensive One-To-One ratio 2-part epoxy product at Michael’s, called Easy cast, I went online to try to get it in bulk, cheaper. Success! I found gallons of it for a bit more than twice the cost of the tiny samples they sell at Michael’s. I highly recommend this clear casting epoxy for all water effects. We still had to pour the lake in half-inch thick increments. As we did, we mounted small fish, crayfish and a few other items to give the area some action and depth. It is very hard to see in photos, but we’ll try to show some of the depth later. Here is our workspace as we added layers of lake, .25″ and 24 hours at a time.